As this years first Open House was fully booked, Eike Linkwitz fortunately decided to invite to these gatherings regularly. The next Open House in Corte Madera is scheduled for April 27th, 2019 10.00 a.m. to 2.30p.m. Enjoy the realistic presentation of LXmini, LXsirius, LXsirius+2 , LX studio or LX521.4. Send an email for number of place reservations at either 10:00 am, 11:30 am or 1:00 pm and for driving directions. Repeating guests are welcome ! V-Frame woofer kit in dark anthracite HDF. and in woofers side panels. single OpAmps and tight component tolerances for improved L/R channel matching. A two step rumble filter for phono application may be switched into the signal path. Jan 19th 2019, Eike Linkwitz hosted the first Open House of the year, continuing Siegfrieds legacy of making his achievements accessible to music lovers. The event was fully booked! As always, a great opportunity to exchange thoughts, get answers and to convince oneself on what really matters for a believable / live-like rendering of acoustical scenes. This was also an opportunity to listen to the first pair of just launched LXsirius, the slim full range loudspeaker. A special highlight was listening to the CD of Craig Allisons Blues Band. Craig was here and partially singing along. Everyone could instantly recognize how well timbre, body and tonality of "recorded" and "live" match on this LX521.4 system. 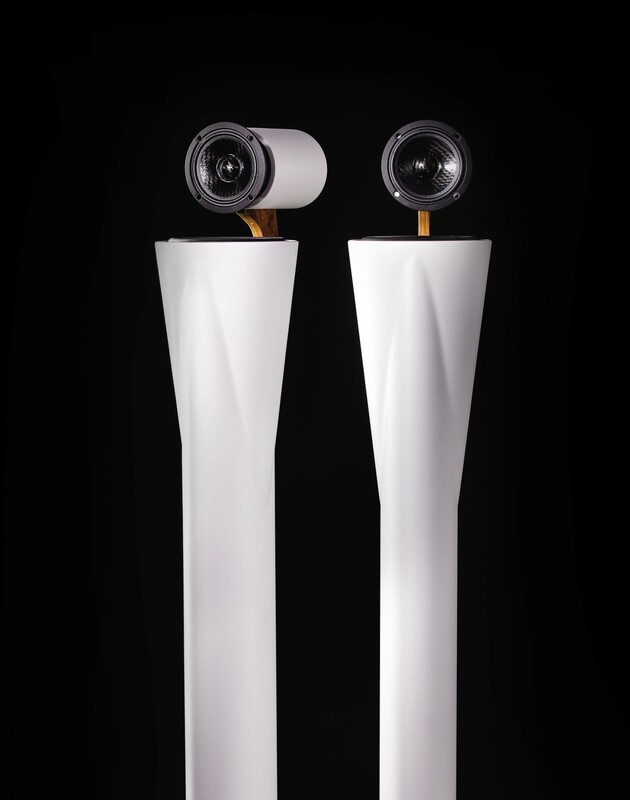 The interested audience got familiar to the design principles of these outstanding loudspeaker systems. Time for discussion and questions. 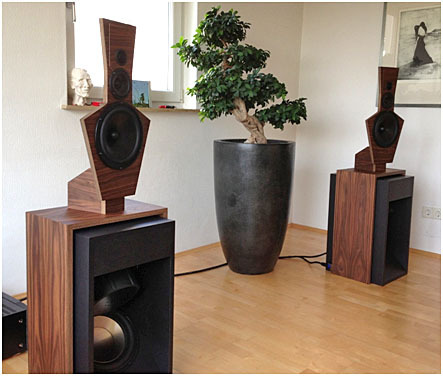 And of course time to hear these unconventional loudspeakers perform, fascinating the audience with their stable, live-like illusion of musical performance, that does n o t collapse when leaving the "sweet spot". Visitors could convince themselves by wandering around in the room: The phantom imaging remains stable, no matter where you listen from. No Room correction at work, no fancy room treatment, no boutique cables. But intelligent engineering and a huge wealth of experience allowed the design of these transducers, that work so well with the room. Eikes fantastic catering (home-made Brownies and more) was a pleasure to everyone. Check out this news page, as well as www.magicLX.com to be noted about future Open House events. 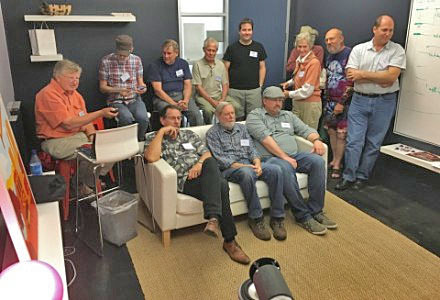 LX loudspeaker audition --- Open House in Corte Madera --- Saturday, January 19, 2019 --- from 10 am to 4 pm. Enjoy the realistic presentation of LXmini, LXmini+2 , LX studio or LX521.4. Compared to the LXmini+2 driven from a single PowerBox the LX521.4 has obviously higher output capability at all frequencies and/or lower distortion. But in all other respects the music and acoustic scene experiences are remarkably similar. The LX521.4 gives a convincing sound illusion regardless of the type of music played and yet the speakers are revealing of every subtle detail in the recording to a mix and mastering engineer. Send an email for number of place reservations at either 10:00 am, 11:30 am, 1:00 pm, or 2:30 pm and for driving directions. LXmini / LXmini+2 / LXstudio may be driven by digital (DSP) or analog (ASP) signal processors. The links above show options for DIY as well as turn-key solutions. 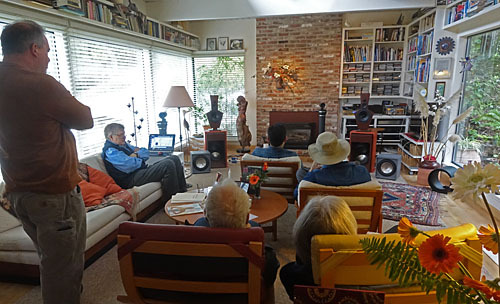 Siegfried Linkwitz´ wife Eike continues the practice of OPEN HOUSE listening experience and sharing of thoughts at the home of "linkwitzlab". The next OPEN HOUSE in Corte Madera will take place in early 2019. Details tbd. SL was sorely missed. 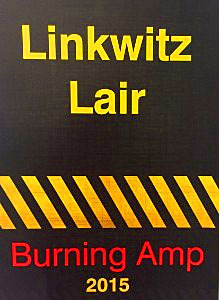 Gladly, his wife Eike Linkwitz agreed to attend the BAF. Nelson Pass and Laurie Fincham found honoring words for SL in their speeches. 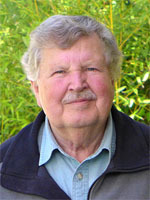 Everyone was invited to write down his individual "Thank you, Siegfried Linkwitz" in an open book. at the Mill Valley Community Center ,180 Camino Alto, in Mill Valley, 8 miles north of the Golden Gate Bridge. There will be a LXmini +2 demo. We plan to have a new balanced version of Nelson Pass` analog JFET buffer/equalization/crossover for LXmini / LXmini+2 / LXstudio. Hope to see you at Ft Mason. Regards, Frank Brenner. Amplifiers - The Emotiva A-800, 8 x 50W amplifier, could be a low cost, satisfactory performance solution for LXmini, or LXmini+2, or LXstudio applications. Driving Force in Evolution and Energy Transmission? We played the LXmini+2 loudspeaker system driven by an ASP, which was derived by Nelson Pass from my original DSP transfer functions to our mutual satisfaction and enjoyment. I plan to give a talk about "Baffle design, diffraction, radiation pattern and stereo imaging" (PDF). Nelson Pass will bring a pair of LXmini with LXsub2 and his 2-way and 3-way Analog Signal Processors using only JFET buffer stages for equalization and crossovers. 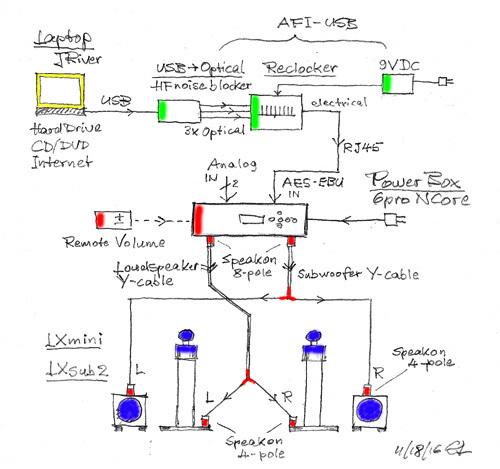 Frank Brenner will bring a proto of his PowerBox with 2-way and 3-way ASP built-in. Links - What happens in your brain when you pay attention? Links - What is so special about vinyl? Links - Music with a Cochlear Implant? Open House in Corte Madera --- Saturday, April 8, 2017, from 11 am to 5 pm. Hear the LX521.4 loudspeaker with PowerBox 6pro NCore and compare it to the LX521.4 with ASP.4, OPPO Sonica DAC and AT528NC 8-channel power amplifiers. Have some fun during Tax time. Send me an email with number of visitors, for time of your arrival and for directions to my house. www.magicLX521.com - OPEN HOUSE in Stuttgart, Germany, on Saturday, March 25th. www.magicLX521.com - Dr. Frank Brenner has opened the magicLXaudio store. Here you find the LX521, LXstudio, LXmini+2 and LXmini offered as kits and turnkey systems of the highest quality. PowerBox electronics use Hypex NCore modules and DLCP for lowest distortion, multi-channel power amplification. A re-clocker is offered, which completely removes jitter from a USB audio data stream. to help music lovers who need more than my DIY construction plans to put together an LX loudspeaker system. 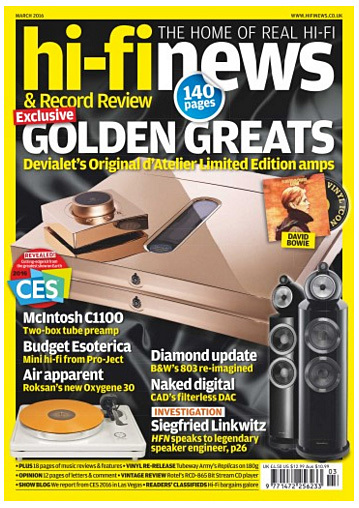 Publications - The Magic in 2-Channel Sound Reproduction - Why is it so rarely heard? 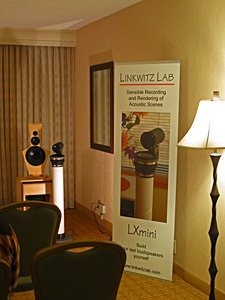 Here was an opportunity to hear the LXmini+2 driven from a PowerBox 6pro NCore from www.magicLX521.com. Equal time was spent to listen to the PB 6pro Master with an additional PB 6pro Follower driving left and right speakers of the LX521.4 system. 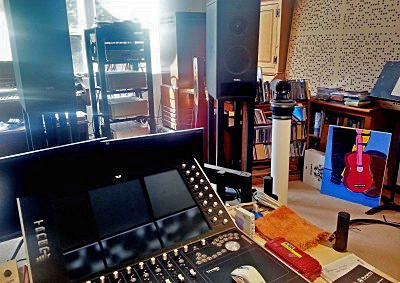 Either system can provide a fully satisfying and realistic sound experience of emotional impact. LX loudspeaker audition --- Open House in Corte Madera --- January 21 and 22, 2017 --- Saturday and Sunday from 10 am to 5 pm. Frank Brenner and I installed a second PowerBox 6pro NCore into my system and I now can also drive the LX521.4. - Fantastic! During the Open House I will demo the LXmini+2 and LX521.4 full-range systems driven from NCore PowerBoxes. I can also change over to the LXmini and/or my miniDSP4x10HD and ATI amps system, if desired. Frank Brenner will not be present. He had to cancel his visit. Send me an email for number of place reservations at either 10:00 am, 11:30 am, 1:00 pm, or 2:30 pm and for directions to our house. which I have ever heard in my living room! We showed the LXmini+2 driven by a PowerBox 6pro - NCore. Input to the PowerBox came from music files on the Hard Drive of my Laptop PC using JRiver for playback. The electrical USB output signal was converted to optical by a AFI-USB HF Noise Blocker & Re-clocker before being applied to the DLCP in the PowerBox. Frank Brenner and I plan to have an Open House in Corte Madera in January, probably Saturday and Sunday, 1/21 & 1/22, if Frank Brenner can get his A380 flight schedule aligned with that date. The PowerBox combines a Hypex DLCP with six NCore power amps, 2x100W, 2x125W, 2x250W. So it is able to feed all LXmini, LXmini+2 and LXstudio from one single unit (€2490 plus VAT). For LX521.4, it takes one PowerBox 6pro NCore per side. his PowerBox 4180 (Hypex DLCP with UcD power amps) to drive them. Hypex NCore based power amplifiers. LXmini owners using the miniDSP 2x4HD please see the new photo on the support page for correct input and output cable connections. then check your LX-Support-Page for the latest update. Publications - STEREO - From live to recorded and reproduced - What does it take? and got into the concepts of 'Gestalt generation' and 'Gestalt recognition'. I will get back to Acoustics and Hearing soon. But first you want to experience LXmini or LX521 ?? My conversations with Fitz - Our conversation continues. It's all about "acoustic size"
LX521.4 owners might check update 11). OPEN HOUSE - Saturday & Sunday, May 14 & 15, 2016, between 10:00 am and 5 pm. 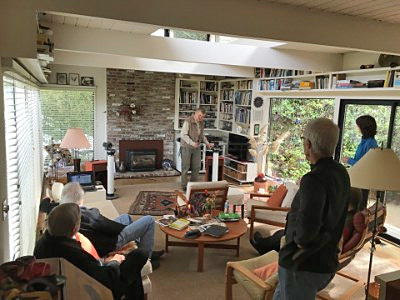 You are invited to come to The Sea Ranch, CA and listen to my LXmini and LX521.4 loudspeakers as set up in our Sea Pine Cottage. Also meet Nelson Pass - my neighbor and friend - who will be present. Send me an email with names, day and time of visit and to receive directions to our house. Since The Sea Ranch is a 3 hour drive from San Francisco you may want to stay overnight and make a beautiful weekend vacation out of this trip. Check with VRBO or VacationHomes for renting a house at Sea Ranch. The small town of Gualala at the north end of Sea Ranch has motels, restaurants, shops and what else one might need for a vacation. The closest large town is Santa Rosa, about a two hour drive away. OPEN HOUSE - Sunday, April 17th, 2016, between 10:00 am and 4 pm. 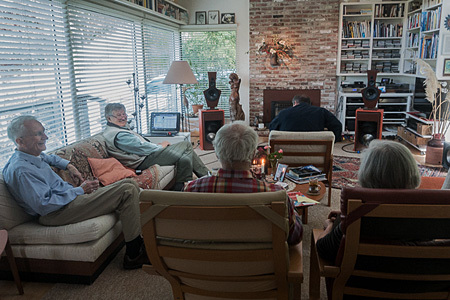 You are invited to come to our home in Corte Madera, CA and listen to LXmini, LX521.4 or LXstudio loudspeakers. Hear the new LXmini+2, a refinement of the LXmini by the addition of compact dipole subwoofers. Meet Dr. Frank Brenner from www.magicLX521.com who will be visiting on his layover day between flights from Frankfurt to San Francisco and back to Frankfurt as the captain of a Lufthansa A380. This is a rare opportunity to meet him. Get your Taxes done by April 16th and enjoy the freedom! 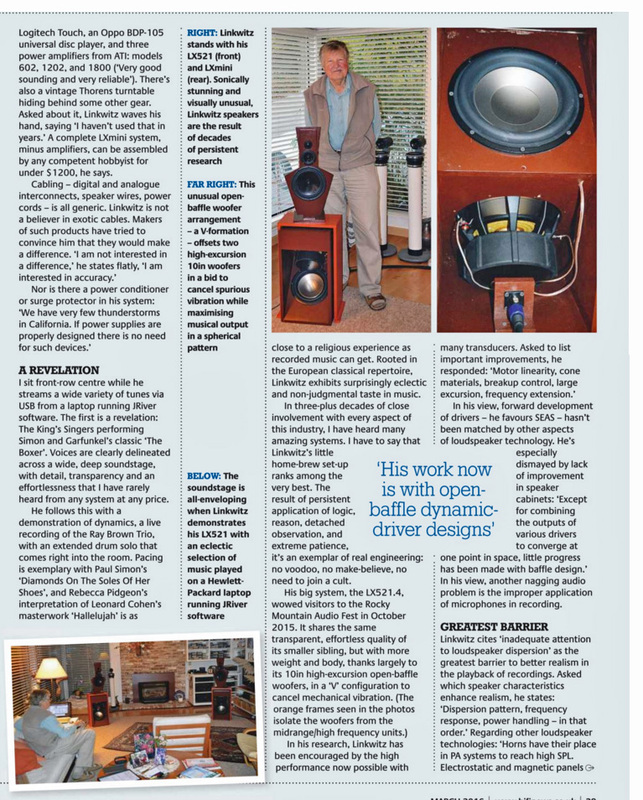 Loudspeakers - Loudspeaker system design - This page was no longer accessible after I had rearranged pages some time ago. 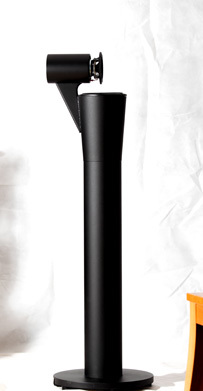 The presented material is fundamental and educational, like a "Loudspeakers 101" course. My Daughter the Jeweler - Surprise someone you love with a little gift! The Sea Ranch - The remodeled Sea Pine Cottage is our second home. LXmini and LX521.4 play here to my fullest satisfaction. Look at my setup and associated equipment. magicLX521 - Dr. Frank Brenner's comments about our Open House yesterday. I will have such event again in the future. "A unique opportunity to listen to LXmini, LXstudio and LX521, presented by the designer himself.... and to experience Eike and Siegfried Linkwitz` overwhelming hospitality. 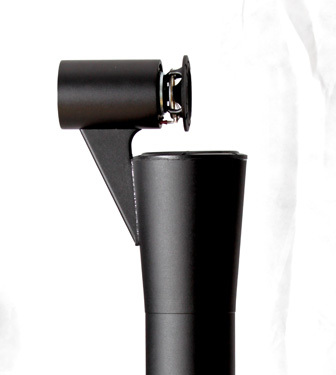 The interested audience got familiar to the design priciples of these outstanding loudspeaker system. Time for discussion and questions . And of course time to hear these unconventional loudspeakers perform, fascinating the audience with their stable, live-like illusion of musical performance, that does n o t collapse when leaving the "sweet spot". Visitors could convince themselves by wandering around in the room: The phantom imaging remains stable, no matter where you listen from. All rounded up by Eike's fantastic catering (home-made Brownies and more). Thank you! Highly recommended, try to get a ticket for a possible future session!" Saturday, February 20th, 2016, between 10:00 am and 4 pm. Send me an email for number of place reservations at either 10:00 am, 11:30 am, 1:00 pm, or 2:30 pm and directions to our house. Saturday, January 23rd, 2016, between 10:30 am and 6 pm. Bring along who needs to be pleased. Send me a note for number of place reservations at either 10:30 am, 12:00 noon, 1:30 pm, 3:00 pm, or 4:30 pm and directions to our house. My Daughter the Jeweler - Have a look! 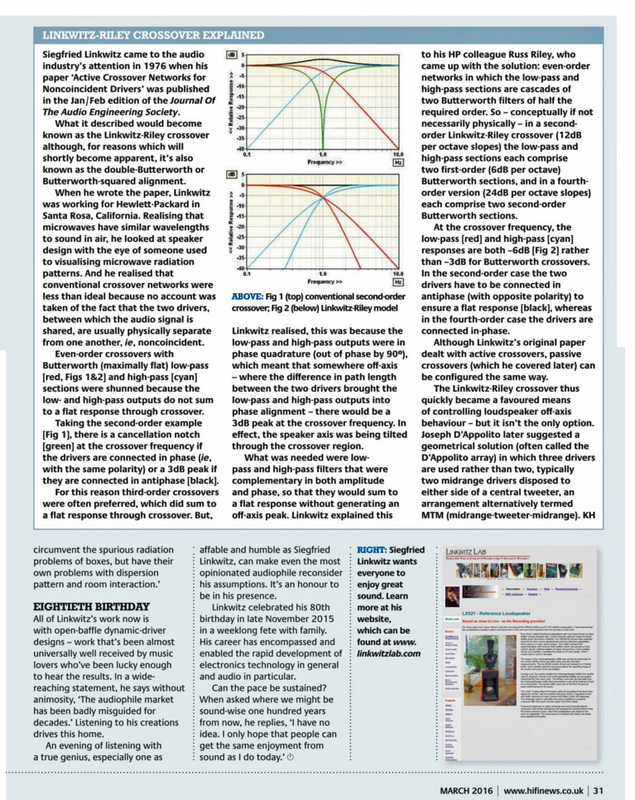 The Magic in 2-Channel Sound - John Watkinson talks about "The Importance of Directivity in Loudspeakers"
The Magic in 2-Channel Sound - My paper with the title "The Magic in 2-Channel Sound Reproduction - Why is it so rarely heard?" 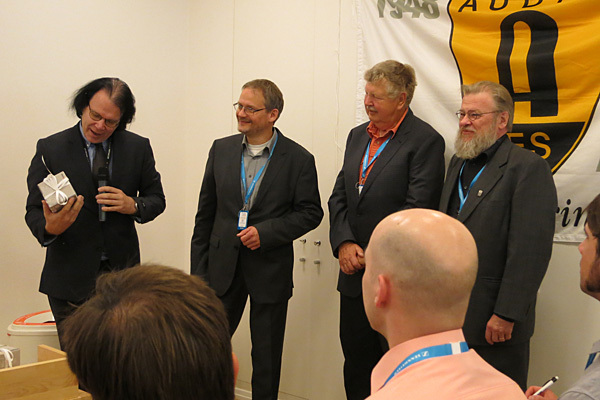 from the IOA Conference on REPRODUCED SOUND 2015 in the UK. The Magic in 2-Channel Sound Reproduction - Why is it so rarely heard? NOTE - The mailbox at is 100% full. I am trying to resolve that problem. 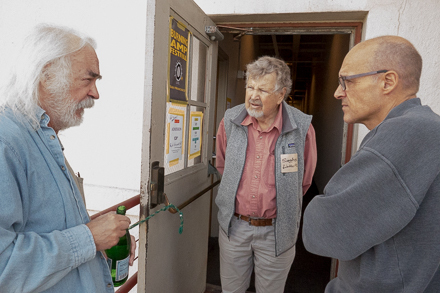 Lyman Miller (center), former HP colleague, audio projects collaborator, and involved with music recording at Stanford University and other places. More photos here. LX521 Supplies - A reworked ASP pcb for 3-way LX521 construction will be offered by "makonats"
Links - Jeff Hawkins of Numenta gives a fascinating talk about pattern recognition in the brain in response to changing sensory input data streams. 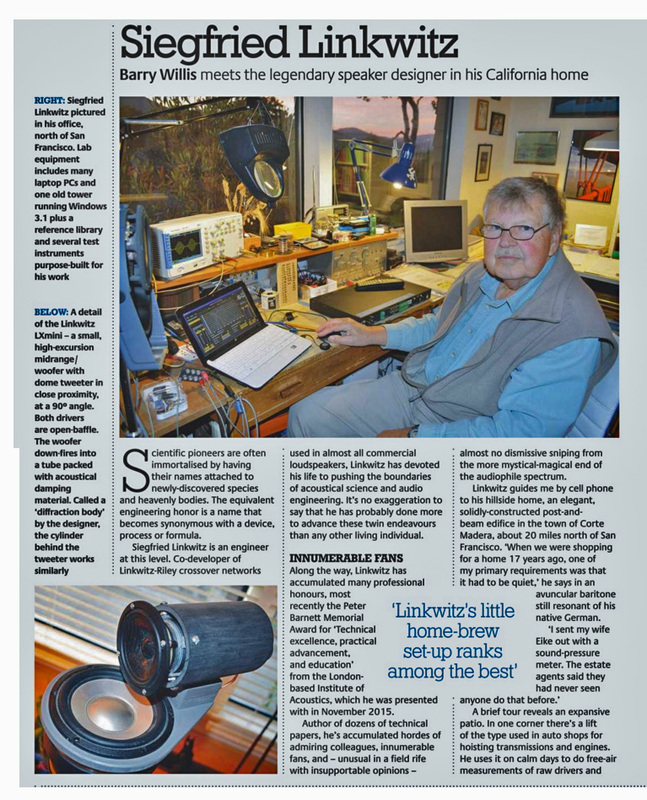 An article about Linkwitz-Lautsprecher written by Schoeps Microphone Technical Director Joerg Wuttke (ret.) will be published in "Das Musikmagazin für Ärzte, tonart 4 | 2015", which is an insert to the Gerrman Ärzteblatt. Burning Amp 2015 on Saturday, October 17th, in Redwood City, CA. See diyAudio for schedule and exhibitors. I plan to demo the LXmini and LXstudio with the PowerBox from magicLX521.com. and will be present on his layover day. Time to pack up! 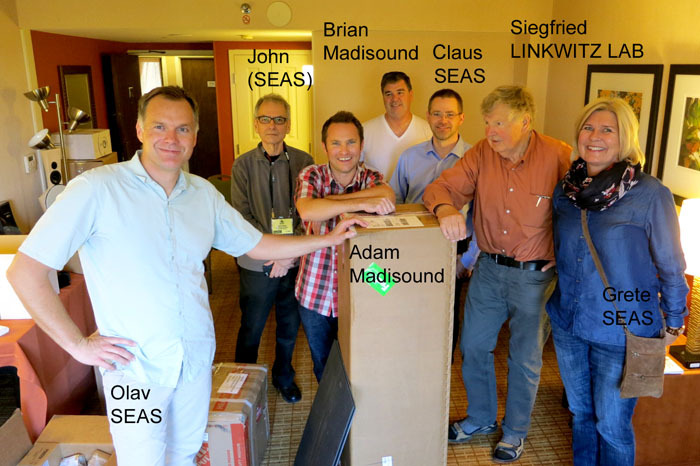 - A big THANK YOU to Adam and Brian from Madisound, to John, Olav, Claus and Grete from SEAS for their help in making Room 514 such an attraction. Thank you to Don from TheOrionSpeakers.com for taking over the demo's to give me lunch breaks and to Brian L and Jeff B from the OPLUG for running a Q&A session about DIY construction of speakers. Thank you to my wife Eike who paid attention, support and loving help in many situations, accommodated our visitors and circulated about 600 Show Times Tickets. She also took pictures, more of which are on this page. used in Room 514 by LINKWITZ LAB with Madisound and SEAS. Join us for an informal question-and-answer with several members of the oplug-support.org forum. NOTE - The mailbox is 100% full. I am trying to resolve that problem. Advertisement by www.magicLX521.com in: Das Musikmagazin für Ärzte, tonart 3 | 2015 , an insert to the Gerrman Ärzteblatt. 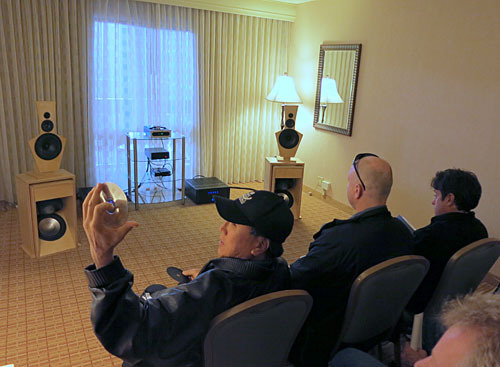 - October 2-4, Rocky Mountain Audio Fest, Denver, CO.
using two Emotiva XPA5 amps and a miniDSP 4x10 Hd. - November 10-12, Institute of Acoustics - REPRODUCED SOUND 2015, Moreton-In-Marsh, UK. I plan to talk about "The Magic in 2-Channel Sound Reproduction - Why is it so rarely heard?" Links - "The Audio Critic" and Peter Aczel's "Audio Legacy"
I just spent several hours listening to the LXmini when driven by the first production sample of the PowerBox from magicLX521. Together with Dr. Frank Brenner, and an Academy Awards nominated audio producer, we three compared the Hypex DSP and UcD amplifier based PowerBox in my listening room to my typical LXmini setup with miniDSP 4x10 Hd and AT1806 amplifiers. I am just astounded how much more is in the LXmini system in terms of low end definition and overall refinement of sound when connected to the PowerBox. We all heard the remarkable ease, openness and neutrality. And I had thought all along that I had a pretty decent setup and that it would be difficult to get even more out of the LXmini! While I can still proudly demo and listen to my LXmini system even with the miniDSP 2x4 and Emotiva amps, it is difficult to forget this comparison session. 1990 to 2011, and you could audition ORION in one and PLUTO in the other. Links - WIZARDS OF SOUND - THE NEW YORKER writes about the Meyer Sound Constellation Acoustic System and the San Francisco Symphony SOUND BOX. 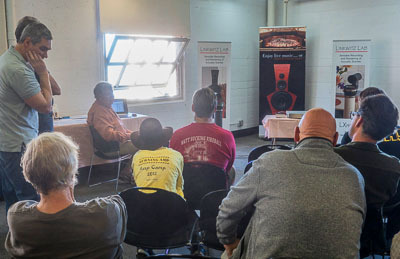 To me one of the most significant events at the Rocky Mountain Audio Fest 2014 was the "Experts ask the Experts" exchange of viewpoints regarding sound recording and sound reproduction. The discussion was honest and enlightening to both experts and audience. The explanations could help audiophiles to understand some of the limitations involved in recording and reproduction, and to appreciate the work done and to make educated choices. 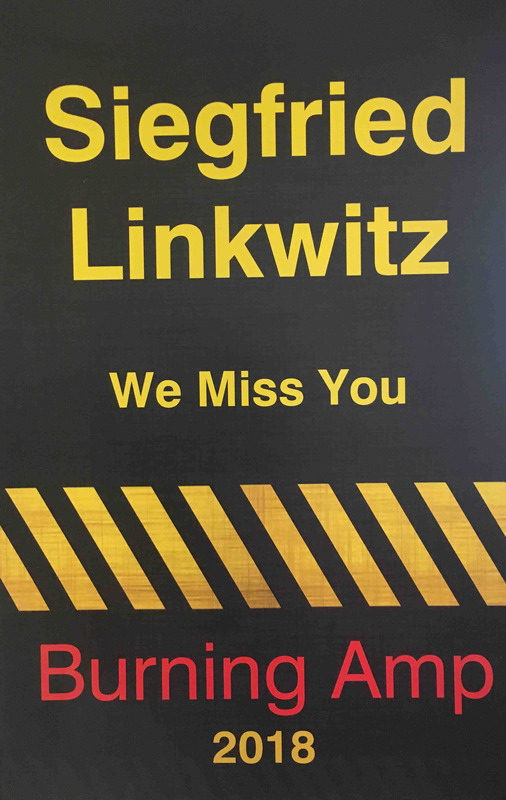 to all LINKWITZ LAB speaker builders, past, present and future! In 2015 I plan to extend the LX speaker family from the analog LX521 and the digital LXmini by adding three new members: LXstudio, LX521.3 and LX521.4. This will provide an upgrade path for LXmini builders to LX521 levels and be a revisit of the LX521 using DSP for equalization and crossovers. For the LXstudio I add to the LXmini pair the two open-baffle woofers of the LX521 and use the miniDSP 4x10Hd for xo/eq. A prototype is already running and impresses me with its fast dynamics, 3D rendering and expected extension of bass. The 4-piece system provides greater flexibility in room placement than the LX521. For the LX521.3 and LX521.4 systems I plan to start out from acoustic measurements again, expecting more options in driver equalization from a DSP unit than was practical with the ASP. The LX521.3 will be a 3-way active system including the existing passive crossover, while the LX521.4 will be a 4-way active system and require an additional pair of power amplifiers. Those are my plans. Let's hear what materializes. 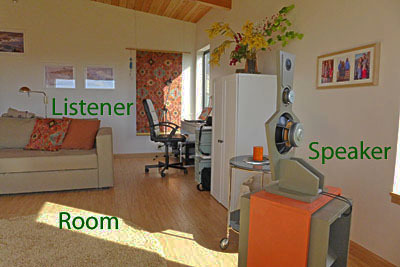 Highly realistic 3D sound reproduction from stereo is also possible in their rooms and is within their reach! 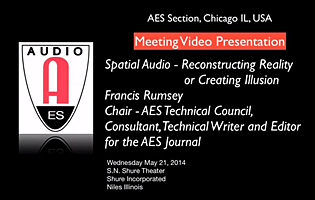 Links - Spatial Audio: Reconstructing Reality or Creating Illusion? 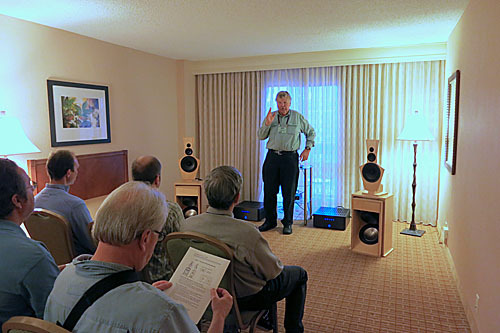 Sound demonstrations of the LX521 and LXmini at the ROCKY MOUNTAIN AUDIO FEST in Room 418 alternated between speakers every hour and drew great acclaim for the naturalness of presentations. 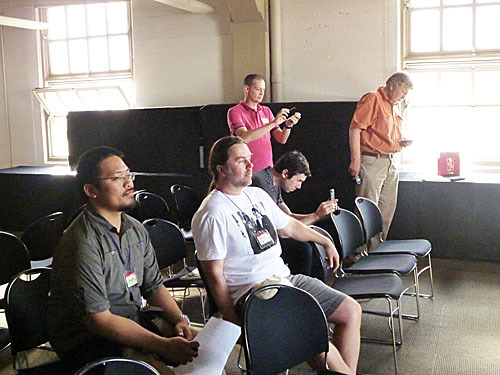 The speakers generated much interest for the LX521 and LXmini DIY materials and driver kits, which were shown in adjacent Room 417 by Madisound and SEAS. We had many visitors come back repeatedly for listening to more music or to bring their friends to share the experience. The LXmini created lots of astonishment and excitement. It put a smile on many a face. The LX521 impressed with resolution and dynamic range from delicate to raw power. OPLUG - RMAF 2014 Linkwitz Lab Show Report? 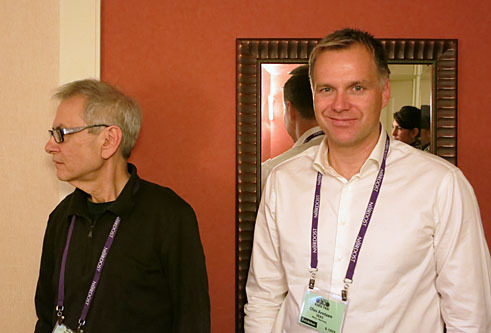 One of the most significant events at the show was the "Experts ask the Experts" exchange of viewpoints regarding sound recording and sound reproduction. The discussion was honest and enlightening to both experts and audience. It was recorded and I hope it will be published soon and without edits, helping audiophiles to understand the issues, to appreciate the work and to make educated choices. Links - "A call for an open source loudspeaker project"
I will be there with the amazing LX521 and the new LXmini Reference Loudspeakers and demonstrate them in Room 418 each day of the show. It is time to make your travel arrangements to the Denver Tech Center, if you have not done so already. The sound you hear in Room 418 should be your reference for the show. Links - Berliner Philharmoniker in the Digital Concert Hall - A great musical and visual treasure! LX521 - Sound as close to Live - as the Recording provides! www.magicLX521 offers the fully assembled and finished LX521 at promotional prices during their Titanium Driver Award campaign. diyAudio - "Extreme Open Baffle Active Speaker inspired by Linkwitz LX521"
Links - "SAVE THE STEREO" and "Pure Audio to Health"
Loudspeakers - "Whatever happened to the quality of reproduced sound in the home?" Pluto Ultimate - Reviewed by "Hifi Pig"
ALMA International - 2014 Winter Symposium - I will talk about: "Whatever happened to the quality of reproduced sound in the home?" 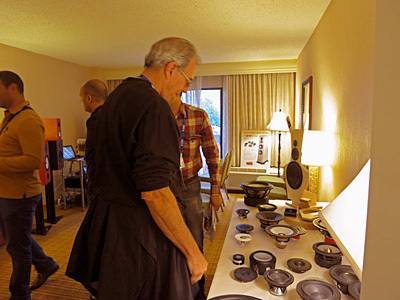 stereophile completed its report on RMAF-2013. The LX521 was not mentioned, though the reporter assigned to the floor was in our room, listened to his CDs, took notes and visibly enjoyed what he heard. 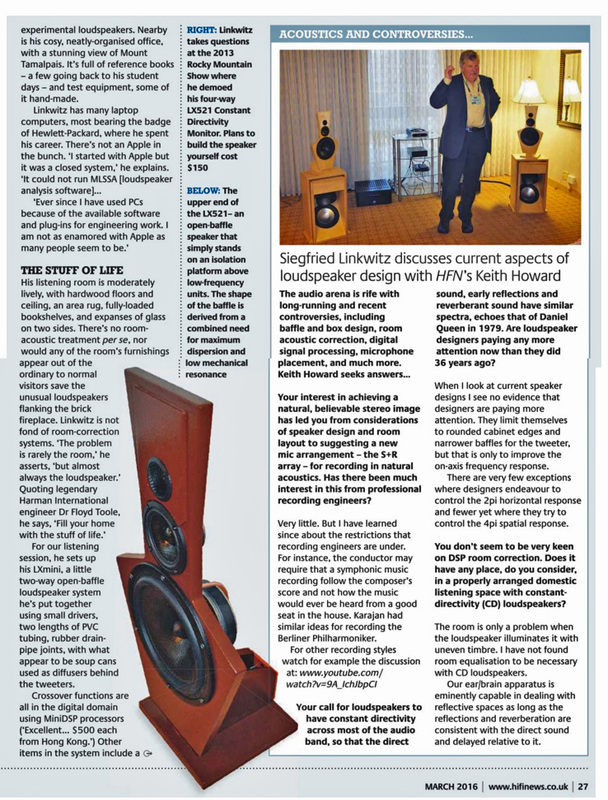 I must assume that stereophile did not consider the LX521 to be of interest or educational value to their readership. Frequency independent directivity for minimum perceptual interaction with the room is found in hardly any commercial loudspeaker design, as can be seen in the photos from the show. Our demo gave immediately recognizable proof of its benefits. The LX521 sends a message to the loudspeaker industry, a message that would be inconvenient to stereophile's top advertisers. If there were fewer visitors to RMAF, we would not have known. Our room was packed almost all the time and many music lovers returned for more, enjoying the clarity, timbre, dynamics and spatial rendering, and thus the believability of the auditory illusion. ULTRA HIGH-END surprisingly includes the LX521 in its coverage of RMAF. The reviewer apparently failed to recognize the significance of the design in comparison to every other loudspeaker at the show. Our emptied out hotel bedroom had no acoustic treatment. But what is "ultra high-end" all about? In this category of audio the price of the equipment usually far exceeds any realistic gain in performance. Who is the audience? I want to satisfy individuals who are still familiar with live (unamplified) sounds in a performance space, or who play an instrument, or make recordings. 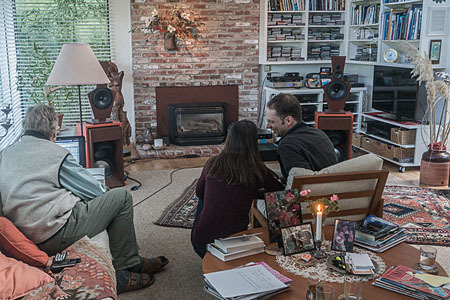 It ought to and can be done in such a way, that many can afford the pleasure of hearing great recordings convincingly rendered in a normal living room. 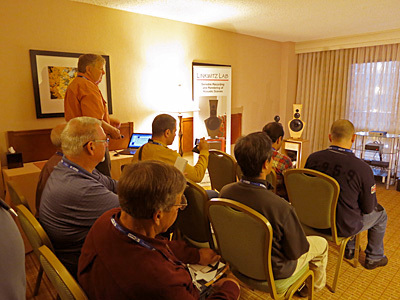 RMAF brought over 400 visitors to our room giving them an auditory experience and appreciation of stereo they never could have had before the advent of the LX521. I surprised myself several times about the speaker's bass output capabilities when hearing new material that visitors brought. We shocked more than one well known loudspeaker designer by the transparency, clarity and dynamics of close to live-like sounds produced by these speakers, and by the believability of an auditory scene devoid of loudspeakers. It was a most enjoyable magic trick, people got lost in the music and many listeners came back to our room for more. As one person wrote to me afterwards: "Your room at the show was 'Hotel California' - the room where people kept entering but never left." 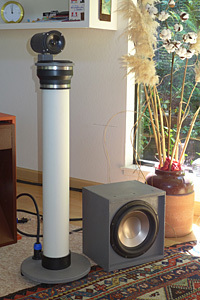 The speakers were assembled from a Madisound flat-pack of wood parts. We used the Madisound assembled and tested ASP. The 12 drivers are all SEAS designs and Olav Arntzen, R&D manager at the time, was more than pleased to hear what his products allowed me to develop. 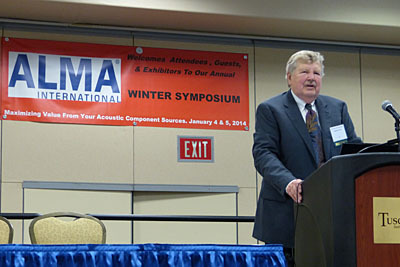 John Stone, US representative of SEAS, played an important role by leaning on R&D for accomplishing certain driver modifications that were needed in open baffle applications. We used a BelCanto (CD2) CD player with built-in preamp and volume control to drive the ASP. Connected to it were two Emotiva (XPA-5) 5-channel amps with 200W/channel output, driving bottom and top woofers separately, midranges and tweeters with 4 channels per side. 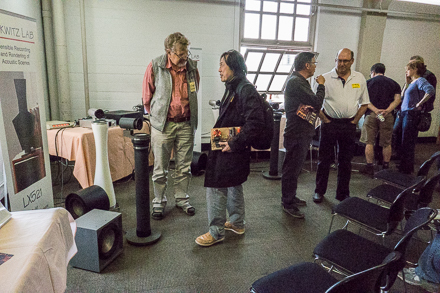 stereophile reports a slow burn at 12 noon, but attendance was merely 10% down by the end of the day compared to last year. Links - The Music Animation Machine - "Music Worth Watching"
PP presentation and talk at AES 51st Conference - "Loudspeakers and Headphones"
LX521 Supplies - What do you need? Home - From where and in what numbers do visitors come to this website? Issues in speaker design - Further thoughts about "Group delay and transient response"